"Anyone who has never battled a bull bass all alone on a beach may not understand the instinctual strand that binds humankind and fish." 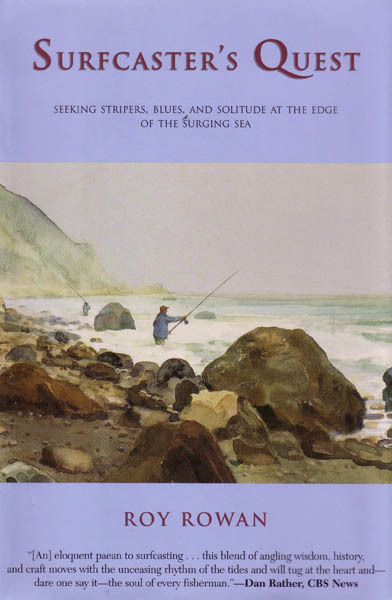 So begins Surfcaster's Quest, Roy Rowan's evocations of fishing the turbulent seas surrounding Block Island. As this beautifully descriptive book points out, angling enthusiasts have maintained for centuries that fishing is not simply a sport but a religion. "Therefore," writes Rowan, "surfcasters with their own devout followers comprise a special sect. They may be a less pious bunch than fly fishermen; but they are an adventurous, feeling group of outdoors lovers who are as deeply moved by the sun, moon, and stars as they are by their desire to catch fish in the waves crashing around them. Surfcaster's Quest describes not only the habits of blues, stripers, bonito, and other gamefish, but also how to trick them into striking at pieces of wood, plastic, and metal flung out from the shore. This is a book about courage, contemplation, solitude, the appreciation of nature--and yes, religion, though not the kind conducted under a church steeple. Interspersed with this thought-provoking mixture of soul-searching and surfcasting are fascinating historical tidbits about the Indians, pirates, and rumrunners who once occupied that obscure oceanic speck originally called "Isle of the Little God," Block Island.